I want to tell you about Frank. Frank is about six feet long, about 250 pounds and has greyish fur splotched with black. He lives very close to me in the harbor in Eureka, CA. The harbor is his "spot"; all the local fishermen know him on sight because Frank has a cute trick he's learned. Frank knows that where there are boats, there is food. Whenever he spots anyone cleaning a fish on a boat, Frank comes over for a visit. If the person cleaning the fish takes too long, Frank amps up the volume. He slaps the surface of the water with a flipper. Then he waits. Still no response from the human? He slaps the water again, harder. He continues this until he is acknowledged….hopefully by the human, very covertly, dropping scraps over the side of the boat. This something that nobody wants to be caught doing by our harbor department, however it must happen often enough because Frank does not appear to be underfed. And he's cute….ok, adorable. So who can resist? Frank is also the biggest guy around; he enforces his right to be first in line at the boat stern buffet ….and he has more than a few rivals. So who, or what, is Frank? 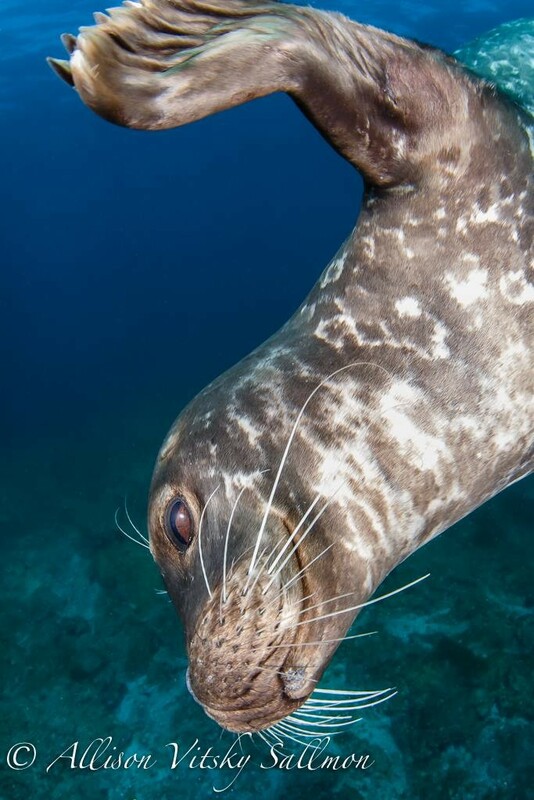 Frank is a Phoca vitulina….a harbor seal. Harbor seals belong to the order Pinnipedia, or pinnipeds, which include animals like walruses, sea lions and seals. On the west coast of California, the five most common pinnipeds are northern fur seals, Stellar sea lions, California sea lions, northern elephant seals and, yes, harbor seals like Frank. So, yeah, they are cute and fluffy, and most of us have seen certain members of this order at one time or another either in oceans, aquariums, or perhaps a zoo. But why is this important? It is important because of Frank's unique place in his ecosystem. Frank has learned how to use all of the resources, including humans with their boats, in his particular ecosystem to his advantage. This is a crucial trait for an 'apex' predator. Broadly, an apex predator is defined as an animal occupying a high position on the trophic ladder…..meaning that within that animal's ecosystem niche, they regulate the other members of their ecosystems, usually through predation. Apex predators tend to be the larger predators in the community, followed by smaller predators referred to as 'mesopredators'. The critical point here is that with its role as ecosystem regulator, the loss of apex predators can lead to a complete ecosystem breakdown as the mesopredators then overpopulate (termed 'mesopredator release'), resulting in downward pressures on every member of the ecosystem. Meaning? The presence of a large number of apex predators is a good indication that an ecosystem is healthy and intact with enough biodiversity and food sources to maintain every level of the tropic ladder all the way up to apex predators. Frank has been around for years, and in all likelihood will continue to be around for many years to come. I love going down to the harbor with my son and looking for Frank as he wanders in and out of the rows of docked boats, looking for snacks. We humans are finally beginning to grasp the critical nature of the role of apex predators. In the face of so much information regarding the imminent collapse of a broad range of ecosystems due to human interference, we are fortunate on the northwest coast of California to have a number of fairly intact ecosystems. The human population at this end of the state is not very large, and we are heavily oriented toward sustainable agriculture and non-GMO crops. We have plenty of fresh water and with the recent statewide plastic bag ban our ecological footprint in all likelihood is smaller than it is further to the south. However, there are areas in the southern part of the state that have lovely, intact ecosystems as well…..and Frank has cousins there, too; he's not the first harbor seal I have had the pleasure of meeting. I was working as a dive instructor as well as a snorkel guide. It was January, and while that meant amazing visibility, it also meant rough water at the surface with 1-2 meter swells. Snorkeling in a farmer john in 1-2 meter swells isn't quite as easy as you might think. After 20 minutes or so, our initial group of 30 was down to just me and 4 other hardy souls. It had been a great tour. We had spotted dozens of lobsters, sea cucumbers and urchins, a few sea hares, and even a couple of very small abalone mixed in among the schools of rockfish, kelp bass, halfmoons and Garibaldi (the California state saltwater fish). We had even had a visit from the resident pair of California sheepheads. It was also the right time of year to spot halibut. While I hadn't had any luck to this point, all of that was about to change. About 30 feet down, on the sandy bottom, I spotted the halibut. It was a good-sized fish, too. It wasn't, however, how I had expected to find it. Instead of being buried in the sand up to its eyeballs, it was being cuddled lovingly by…..yep, a harbor seal. While we looked on, the harbor seal was busy chewing on her breakfast, too enamored with his meal to notice us at first. Like I said, the fish was big and the seal was having trouble maneuvering it around to get a proper bite. As she rolled over to reposition her mouth, she spotted us at the surface and froze. This was years before I knew Frank, but for the sake of continuity, I'll call her Francine. I often wonder, with animals not having the capacity of language, what must go through their minds when they spot humans. I wondered what this lady was thinking. I imagined her thought process would lead Francine to the conclusion that, rather than risk having to share her breakfast with us, she should seek the shelter of deeper water. I was imagining that, in addition to not wanting to be harassed by snorkelers, food was the number one priority for Francine. It turned out I was completely wrong. What Francine did next was remarkable. She tucked her halibut up under one flipper and swam toward us at the surface for a closer look. Since there were so few of us remaining, we had formed into a circle of black neoprene corks as we bobbed up and down on the surface in the rough water. The seal popped up in the middle of our circle and stared at each one of us in turn. 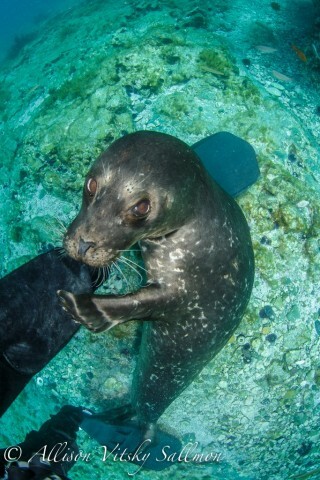 I'm not too sure what any of us did at that moment that made the seal think of a game. However, something happened because she swam back down to the bottom, found a handy rock, tucked her halibut snack under the rock and then swam right back to us. For the next 15 minutes, she tried to get us to play follow-the-leader with her as she darted in and out of our circle, from the surface and then diving down to the bottom again. For our part, each snorkeler bundled into a combined 10mm of neoprene and with no weight belt, trying to dive down even a couple of feet to follow the seal was rather like trying to stuff a cork back into a champagne bottle. We popped to the surface after each attempt looking like popcorn exploding out of a hot pan. But it was great fun, and something I will always remember. Eventually, Francine remembered she was hungry and wandered back down to retrieve her breakfast and then silently faded into the kelp forest. It had been an incredible experience, another important indicator of the health of the ecosystem on Catalina Island. There are necessities and priorities for any living thing to have in order for it to survive. Basic needs like safety and food must be met before an animal can bother to be concerned with leisure activities. The fact that this particular seal felt safe and well-fed enough to take such an interest in us as to not only interrupt her meal, but abandon it on the bottom, however briefly, to come and play with us is an important indication of the health and viability of the marine ecosystem surrounding Catalina Island. There are sign all around us that there are still viable, healthy ecosystems in our world. By taking note of examples like Frank and Francine, and observing how they operate, we can expand on these successes. There is still time to make a difference. Alor Diaries - "Oh Captain! My Captain!" I have been obsessed with traveling the world for over 30 years and have gotten some amazing insights. 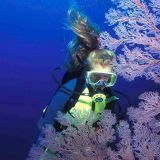 As a diver, I am passionate about the marine environment and conserving its resources. As a mother, I am passionate about the global environment, and preserving it so future generations have a place to call home. I live in the heart of redwood country, in Humboldt County, CA.